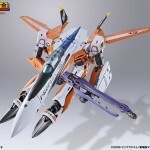 The Tamashii WebShop has revealed parts sets that Macross Frontier fans have been waiting for; DX VF-25F and DX VF-25G Renewal Version Tornado Packs. 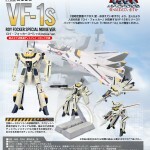 Each set retails for 7,344 yen, with the VF-25F pack due out in July with the VF-25G pack due in August. 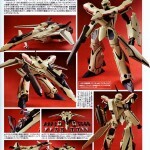 Tornado packs made their debut in the 1st Macross F movie. Images are attached, read on to check them out. 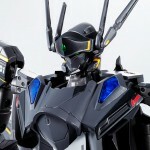 Tamashii has released their official images of their upcoming DX YF-25 Prophecy. 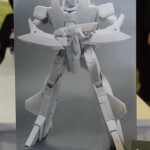 This is the prototype of the VF-25 Messiah. Prior to this, it only existed in 1/72 model kit form. For those wishing for a perfect transformation toy with diecast metal, your wish has come true. The Prophecy hasn’t been seen much, it was last seen in Macross The Ride. 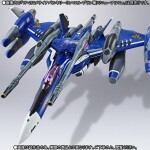 Tamashii has posted their official images of their upcoming DX YF-29 Durandal Ozma Lee Custom. This is a mass-release item and is due out in Japan in May for 18.360 yen. 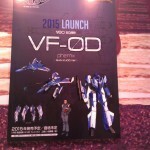 Ozma’s YF-29 made its appearance in the Macross 30 game for PS3. It features an all new head sculpt with the typical 4-laser configuration seen on almost all “S”-type Variable Fighters. 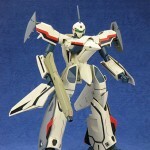 Read on to check out more images of the DX YF-29 Ozma Custom!